They’re simple to make with a handful ingredients: almond flour, grated apple, unsweetened apple sauce, coconut oil, vanilla, and cinnamon. If your children have a sweet tooth you might want to add a tablespoon of maple syrup or honey to enhance the sweetness. Is almond flour safe for small children? The American Academy of Allergy, Asthma and Immunology, recommends to introduce highly allergenic foods like nuts, dairy, eggs, and seafood around six months. Delaying these foods may actually increase the risks for allergies later in life. Almonds are perfect food for babies and growing children because they’re an excellent source of good fats and protein. They also offer high amounts of important minerals such as potassium, magnesium, calcium, iron, and zinc, and are a great source of vitamin E.
Keep in mind it is recommended to wait until your child is 4 to 5 years old to give whole nuts to avoid choking. Melt the coconut oil if needed. In a small bowl, mix the melted coconut oil, grated apple, apple sauce, and vanilla extract. 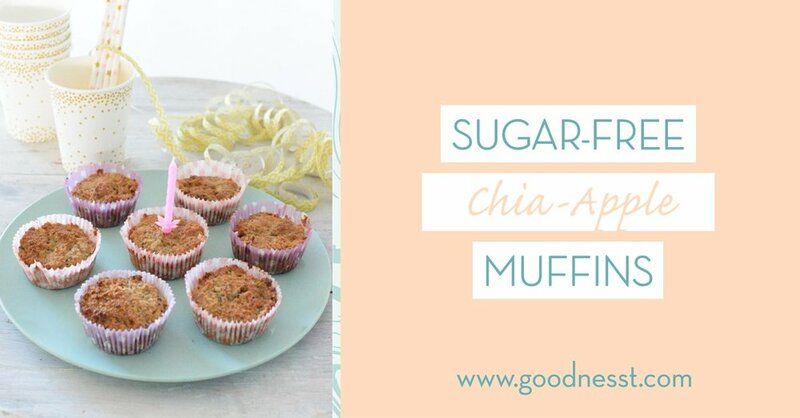 In a separate bowl, combine the almond flour, chia seeds, cinnamon, and baking soda. Combine the wet and dry ingredients with a wooden spoon or spatula, making sure to not overmix. Fill a muffin tray with eight muffin cups and spoon the mixture into it. Bake for about 20 minutes or until the top starts to brown. Allow to cool before eating or storing in an airtight container for up to a week.